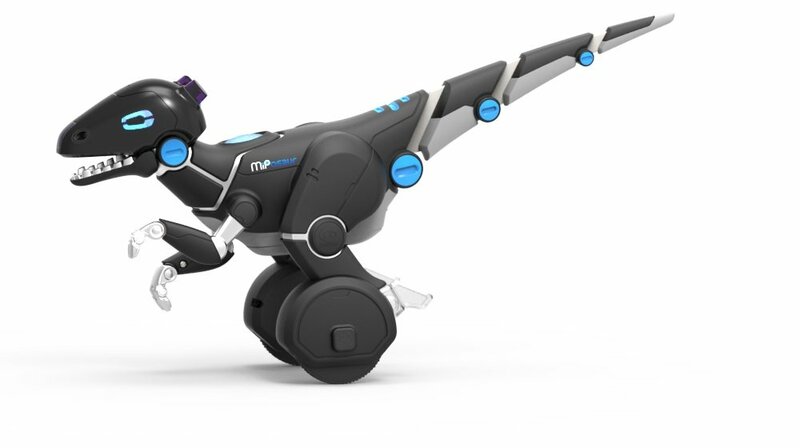 Meet Miposaur- the highly intelligent robotic creature with an impressiveblend of character and technology. Equipped with GestureSense, swipe yourhands to activate its many sensors. Cover his muzzle for a playful reaction,or experience his mischievous side by yanking on his tail. Train him to sitforward, backwards, and even sit back up! MiPosaur comes with a trackball,that it follows, chases, guards and reacts differently to depending on mood.Use it to teach new tricks, feed, or activate fun modes like dance! Downloadthe free app to uncover loads of free games! Control it with drive mode, watchit take on other MiPosaurs or MiPTM, or feed different foods that will alterits personality. Throw in a steak and you'll have a fun loving dino, but flinga sock, and approach at your own risk! ROBOTIC FEATURES Hand gesture commandrecognition Unique dual-wheel balancing Evolving intelligence forprogressive play Comes with a BeaconSense infused trackball, that Miposaurwill flawlessly keep in sight Use the trackball to activate modes such asdance, feed or chase APP FEATURES Direct drive control over MiPosaursmovements; Path tracing; Compatible with Bluetooth Low Energy (BLE) 4.0enabled devices. New functions progressively added for enhanced valueproposition Compatible with Bluetooth Low Energy (BLE) 4.0 enabled devices.